A cooling system pressure tester is a tool you don’t know you need until you need it. There you are, having a nice Saturday drive, when all of sudden the check engine light comes on, you notice the engine temperature gauge is buried in the red, and a fine tendril of steam is emerging from under your hood. What the heck! What’s wrong now? You make a stop at a gas station or auto parts store, pick up a jug of coolant, pour it in and drive home. Once in your own garage, you take a look. Like magic, that coolant you added is gone, and you have no clue where it went. Troubleshooting time! Where to start? Radiator cap, hoses, the radiator itself, or (shudder!) any of the dozen possible fittings on the engine? Don’t even utter the words “head gasket”! You can stare at the engine compartment for an hour scratching your head, or you can get out a cooling system pressure tester, and diagnose exactly where the problem is in ten minutes or less. What exactly is a cooling system pressure tester? First, how does your cooling system work? The system circulates coolant through your engine where it carries away heat, then into the radiator where the heat is radiated away into the air. The cooling system operates under pressure, 10 to 15 pounds per square inch (psi). This raises the boiling point of the coolant, like a pressure cooker raises the boiling point of water in your kitchen. Around and around it goes, unless it leaks out somewhere, then there’s nothing to remove heat anymore, and your engine overheats. 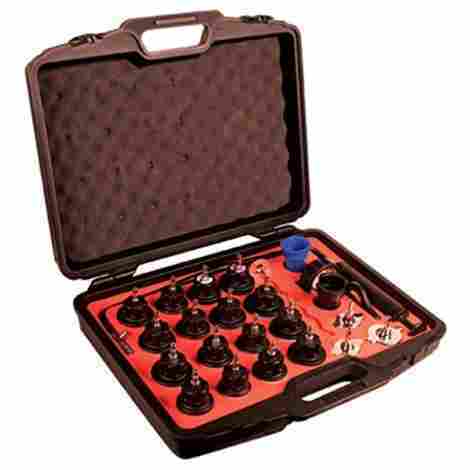 The Stant 12770 cooling system pressure testing kit has everything you need to begin testing vehicles, packed in a convenient black case. The hand pump includes a large, accurate pressure gauge reading 0-30 pounds. The higher range enables testing today's vehicles, designed to operate at higher pressures. You'll be testing cooling systems within five minutes of opening the box, and be the envy of your neighborhood with the Stant 12770 in your toolbox. It includes a spacer for deep filler necks, and an adapter for testing standard "A" size radiator caps. It's simple, it's easy to use, and it will make your cooling system diagnosis and repair tasks much easier! SAE "A" size caps properly fit a 3/4" deep, 2-1/8" outside diameter radiator neck, which is standard size radiator cap for most American cars from the 1960s forward. If you need to test an "imported" car, you can get an appropriate adapter. Of course, we all know that "import" cars are manufactured in Ohio, Kentucky, South Carolina, and few other states, but you know what we mean! You are not forced to buy adapters you'll never use, but there are Stant adapters to fit most any car you encounter. You never know when you'll trade the old Ford in on a Lamborghini Huracán! The Stant 12770 cooling system pressure testing kit comes in at well under a hundred bucks... well enough under you can take yourself and a friend out for lunch and still afford dessert. It's value lies in modularity. You can buy the kit and if you need an adapter for your specific application, buy that separately. 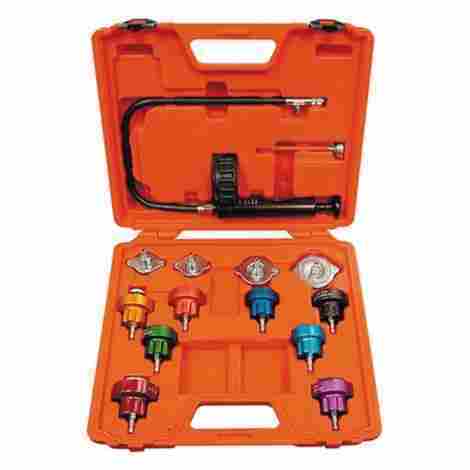 You won't have a bunch of weird adapters for rare cars cluttering up your toolbox. The FJC 43645 Master Radiator and Radiator Cap Pressure Test Kit will test the cooling system and radiator cap of almost any car you encounter. This is one of the most complete kits out there, no need to shop for adapters, it's all right here in the box, including adapters to fit late model GM and Ford products! Need a lot of coverage? This kit has it all. Tests GM, Ford, BMW, Chrysler, VW... on and on. Old, new, you can check out the cooling system with the FJC 43645. This would be suitable for a professional shop. Be ready for summer, when those overheating cars start rolling in, steaming and smoking. You can put everything in your cooling system to the pressure test with a complete FJC 43645 cooling system pressure tester. Including, of course, the radiator cap. You'd be surprised how often an old radiator cap is a problem in many cars. The nice thing is that it's usually an under-$10 fix. Even nicer is the ability to test caps on the fly and know before your go to the auto parts store that it is indeed the problem. This is not a cheap set of pressure testing tools, but as mentioned above, it is very complete. You'll be set to test anything you come across with the FJC 43645. The up-front investment may be a little higher, but you should never need to buy additional parts and adapters. A strong number three on our list is the Mityvac MV4560. This tester is simplicity defined, with a hand pump, gauge calibrated to 30 pounds per square inch, and adapters for most common cars included. The included adapters will fit most common American, Asian, and European cars. The Mityvac entry on our list of cooling system pressure testers is very simple but effective. A plastic hand pump of an ageless, durable design couples to radiator adapters via an included plastic hose. Pressurizing the system per the instructions and the clearly marked gauge will allow the easy diagnosis of items causing coolant loss such as loose clamps or leaks in the hoses, water pump or radiator. Pressure testing will reveal internal engine problems as well, such as a blown head gasket or warped head. You can be testing a system 5 minutes after you take the Mityvac out of the box. Simple construction and intuitive use get you going fast. We liked the fact that it's self-explanatory, though we always recommend reading the instructions on any tool you buy, and more so on something designed to apply pneumatic pressure to a critical engine system. We don't think you'll need to spend hours at it though, you'll de in action quick! The Mityvac is a strong value leader. We noted it costs less than what many professional shops charge for an hour of labor. Each use will return that value again and again, so we are pleased to recognize this cooling system pressure tester as an excellent value. Number four and "best of the rest" is the Kauplus cooling system pressure tester. 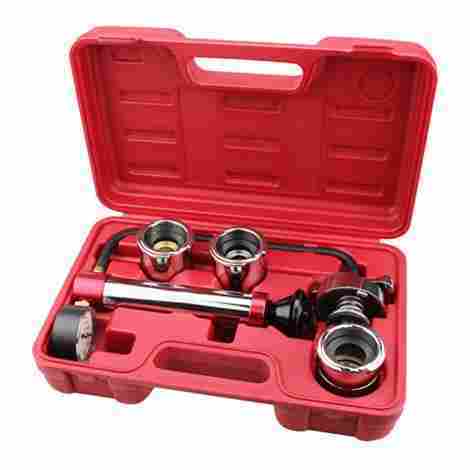 Included is the industry-standard hand pump and pressure gauge set, plus adapters to fit most domestic and imported cars. The system tests to 30 psi, good to test both older and late model cars. The Kauplus 4350283236 cooling system pressure tester will test a system up to 30 psi, sufficient to test the newer cars that operate at higher pressures and temperatures for increased efficiency. Always check your vehicle's specifications for correct pressure values to use! You'd not want to overpressurize your system, possibly causing damage. The Kauplus will also test radiator caps, making it a complete solution for your cooling system test needs. That would be cars, not beer! This cooling system pressure tester will do both with the included adapters. Most cars are testable with this kit. The adapters connect between the radiator and the hand pump, working to maintain an seal and allow you to apply pressure on the system. You should always work on a cool system! Not cool like a Maserati, but cool like you've let the engine cool down to where its safe to work on. This is a lower priced option which led us to place it a little higher on the list. It's all about value, yes? You always want the most bang out of your buck, and no bangs at all out of your engine. This will certainly give you one, and help you get to the other without paying hefty auto shop rates. The multipurpose UView 550000 not only checks for leaks in the cooling system, but, once the leak is found and cured, will help you pressure fill the system in two minutes or less, eliminating airlock, another problem that can lead to heat issues. With the UView 550000, you see more of nice brass fittings and less of plastic. Made to handle the pressure, it will not only test your system and radiator cap, but pressure fill your cooling system fast! Save time when you do routine service on your cooling system! We note that the price of all this speed and versatility is you will need an external air compressor to make it work. This tool will not only find the leak but fill the system for you using a patented venturi flow system. You'll be able to fill the entire system after leak checking in less than two minutes, including the pesky heater core, sometimes hard to get fluid to. This is another more expensive option, but we like its versatility and multi-use capability. This can save spills and frustration when filling a cooling system. Don't be frustrated, be equipped with a UView 550000. It cures one of your troubleshooting and service issues. Number six on the Best Cooling System Pressure Testers list is the Redline Detection 95-0700. Redline says it is a !00% universal product; fits all cars! It will test the cooling system using Redline's SmartFit design adapter. 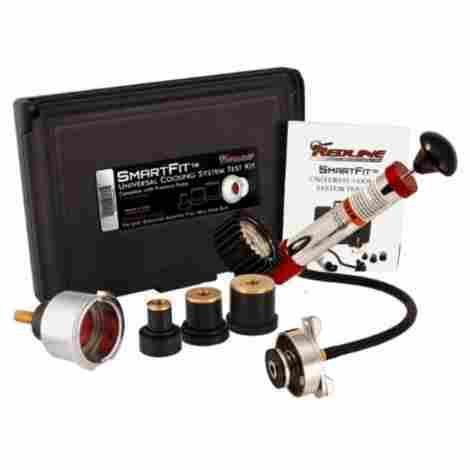 Redline Detection's 95-0700 cooling system pressure tester uses Redline's trademarked SmartFit adapters to fit 100% of passenger cars, light trucks, and SUVs. The pump and adapters are made of nicely finished anodized aluminum and polished brass. All that brass and aluminum keep this unit looking as good as it works. It will test systems up to 30 psi, pressurizing the cooling system without running the engine and allowing you to find leaks fast, on a comfortably cool engine. The cost is in the upper third of similar kits, but an extra cost is offset by the universal fit. There are no adapters to buy, ever. What you see is what you get is what you need. The only drawback is this set will not test radiator caps. The seventh position on our list of the best cooling system pressure testers is held by the OTC 7991. A near-universal fit to all cars, light trucks and SUVs, OTC's entry will even test some marine engines! If you've read this far, you know there are a bunch of cooling system pressure testers out there. Maybe one has caught your eye, and you're ready to buy. The OTC 7991 is still deserving of consideration (and there are three more after this on our list!). This OTC unit is a near-universal fit to most cars, light trucks, and SUVs, and will even work with many marine application engines! 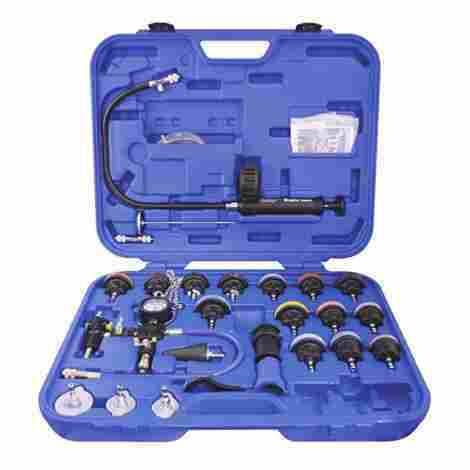 Packed in a blow-miolded case, the kit includes the air pump, gauge assembly and adapter to fit the radiator neck. It's ready to go right out of the box. OTC has a reputation for very good tools at very reasonable prices. This cooling system pressure tester shows that: nicely finished and complete. The universal fit bladder is easily replaceable if it should break. You will get years of service out of this kit; it will save your day when you need it the most. The cost is in line with the other offerings in this category. The kit does not test radiator caps, as some higher rated kits do. The manufacturer states it will not fit some Saturn, Kia, and Jeep models with a plastic reservoir. Here comes number eight on the cooling system pressure tester hit parade, the Astro Pneumatic 78585. This is the do-it-all kit that you want for your birthday. It pressure tests the entire system (including radiator caps), and does purge/fill operations on the cooling systems of most cars on the road today. This is a big kit, because there's a lot of stuff in it. Pump, gauge, fill/purge adapter, and pressure test adapters to fit... well, pretty much everything. Mercedes-Benz, GM, Jeep? Got that covered. Peugeot, Subaru, Chrysler? Uh-huh. Will it test radiator caps? Yes! Acura, Mitsubishi, Nissan? Yup. 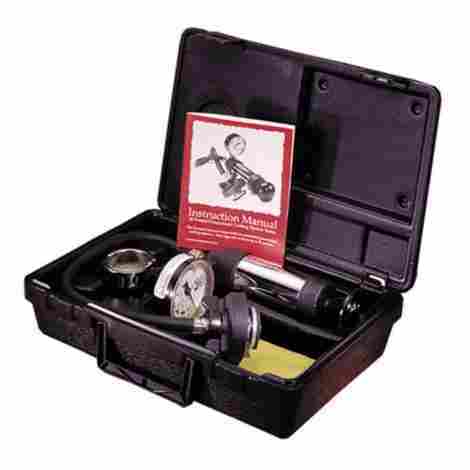 Later model vehicles run at higher pressures than once up a time, but this kit is ready, able to test up to 30 psi. Will it test Mazda, Toyota, Infiniti? Of course. The hand pump and accurate gauge will test any system out there. Geo, Suzuki, Isuzu? Why yes. You should always consult the manufacturer's recommendations prior to pressure testing. But have no fear, the Astro Pneumatic 78585 will adapt to and test anything. Lexus, Volvo, Saab? Yes! One of the good things about a cooling system pressure tester is will also give you a negative result, even on your Citroen, Renault, or Fiat. Pump it up, and if you observe no leaks, and the system holds the pressure displayed on the gauge, you are good to do. Great to check your work on your Alfa, Mini Cooper, or VW. As you might expect for such a complete and capable kit, it is at the higher end of our price spectrum. For this reason, we rate it at eighth place. We have no concerns about quality, only affordability for the consumer. But will it work on your BMW, Ford, or Opel? No problem! If it's in your budget, this is the jack-of-all-trades of cooling system pressure testers. The Astro 7858 cooling system pressure tester is the little brother to the preceding Astro kit. A simpler option, it still includes a full range of adapters to fit most import and domestic cars, the standard hand pump and gauge, and a bonus thermometer to check the operating temperature of your engine coolant. The ninth entry on our list of best cooling system pressure testers, the Astro 7858 kit includes three basic sizes of radiator cap, plus adapters to fit a vast number of imported and domestic cars, light trucks, and SUVs. The Gauge indicates from 0-35 pounds, a slightly wider range than most other test sets. It will easily test the newer vehicles with higher pressures normal in their cooling systems. This cooling system pressure testing kit includes a bonus thermometer. Finding out just how hot things really are under the hood can be a key piece of information in troubleshooting pesky cooling problems. Information is power, and Astro is giving you the power with the temperature and leak detection abilities of this great kit. This kit is in the middle-upper range of our price band. It presents an lot of capability for the price, though there are less expensive options that seem to do as well. It's a well-crafted cooling system pressure testing set, we are sure you'd be happy with it. Astro Pneumatic has all the options covered. The Goplus TL31078 cooling system pressure tester is a budget entry in the field. 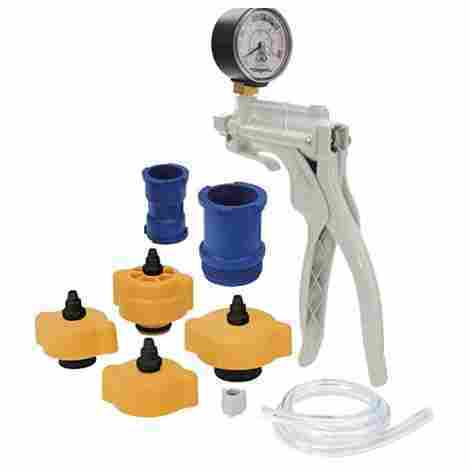 It features the standard hand pump configuration with pressure gauge attached. A series of caps in different styles, and adapters to various cars round out the set. Here we have the final entry on the top 10 list of cooling system pressure testers, the Goplus TL31078. It one of the least expensive testing kits we looked at. 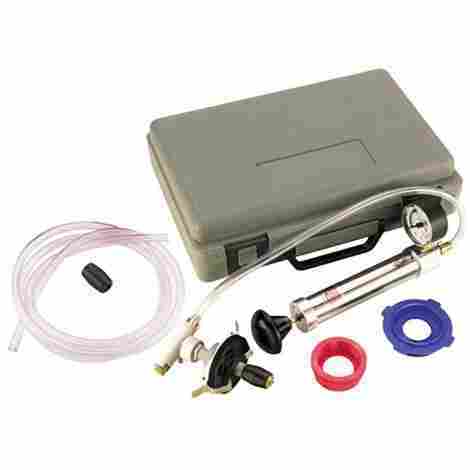 It includes the usual hand pump, gauge registering to 30 psi, and a set of adapters to fit a large number of cars. Here's a problem though, the included adapters apparently fit mostly Asian and European cars; the most common American makes are omitted. If you're buying for the North American market, this might not be your first choice. The kit and its adapters are reported to have some fit problems, with a few users complaining of leaks where the adapters don't fit securely, or of having to apply sealant to the hose assembly. Others reported no such problems though, meeting with full success using this inexpensive set. At the bottom end of the price scale for this type of set, the Goplus set is a great value, but one with a few ifs: if it works with the cars you want to use it on, and if you are happy with the fit of the adapters to the radiator, and no leaks occur. If you are willing to do your homework and scan the list of cars it will work on, this might just be a steal. We’ve scoured the world of tools, and this list is what we found as the best 10 cooling system pressure testers on the market. You can spend a lot or a little, buy the complex set or the simple one. Somewhere here there is the kit you need. We hope we’ve shown how you do, really, need one of these. Like most test sets, you don’t know you need it until you need it. When we talk to shade tree mechanics and home do-it-yourselfers, we find over and over again that they make many purchases under duress: something is broke, and they have a limited time to fix it. At that point they reach out and buy anything to put the fire out, so to speak. We recommend an orderly system of acquiring tools before you need them to avoid panic purchases. It’s a great plan, isn’t it? Ok, back to reality! When are pushed against the wall to get a job done, use our lists to find what you need. We work hard to sort through the options and recommend what we think is best. Use our knowledge and turn to a Drivrzone buying guide when you shop for your car and driver needs. We are putting new guides up frequently! We hope to be your resource for many buying decisions. Check back often! Now, what did we think about as we looked over these cooling system pressure testers? Read on! These cooling system pressure testing kits by their very nature are modular: at their heart is an air pump with a pressure gauge, and from that point, they expand to fit many different cars through the use of adapters to fit the various radiator neck sizes and types. Many testing kits also included hardware to allow the testing of radiator caps, a very important piece of your cooling system that must be tested separately. We gave the highest ratings to those kits that started with an inexpensive but broadly capable base and let you buy adapters as add-ons as, and if, you need them. 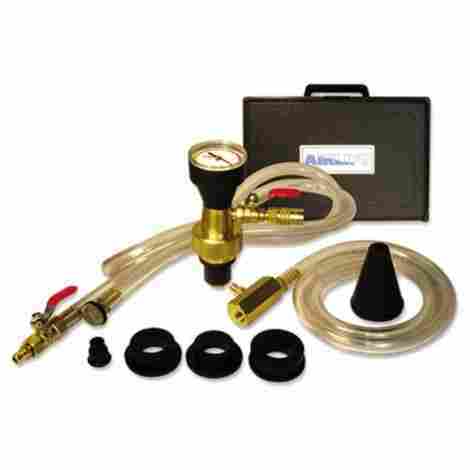 Some cooling system pressure testing kits come with everything a professional shop needs, at a price. That’s great if you are a professional shop! If not, budget versions with similar quality but fewer options are what you need. We gave high marks to the cooling system pressure testers that fit well and did not leak in their own right. Obviously, an ill-fitting adapter that leaks will immediately negate any test you’re trying to perform with it. Some kits have been reported to have adapters or even pump/hose components that are finicky, that is, they need to be adjusted just so before they work properly. This can be frustrating or even prevent a successful test. We gave high marks to those cooling system pressure testers that reported few if any, such problems. The cooling system pressure testers that fit or include the adapters for a wide variety of common cars, SUVs and light trucks got our attention. North American domestic cars and the major imports make up the bulk of what’s on the road and in your garage. Paying extra for a kit that fits cars you’ll likely never see makes little sense. A focussed set of adapters on common cars formed our best entries. Having a nice case to keep things together is important. You can have the best cooling system pressure tester on the planet, and if you can’t find all the bits to make it work, it’s not any good to you. We all try to keep out garage organized, but we are also human! Some of us have little humans that come around to “help” us, too, and you know how that goes! This is probably not a tool you are going to use daily, so keeping it ready to go is a little harder. We therefore really like the testers (and any other tools, for that matter) that come with cases to protect them from the chaos of normal life. Any tool is only as good as its ease of use. If it’s difficult and frustrating to deal with, it’ll never leave the toolbox, and what good does that do you? Spending good, hard-earned money for something you never use represents money wasted. So we look closely at ease of use for everything we review. The best engineering will take a difficult task and make it look easy. The best tools will let you take a difficult task and make it look easy. Spend your money wisely and make your life easy. That’s our goal here, to help you towards that goal! Bringing it all together and balancing all the criteria above, we look for the best value we can find. Nothing is perfect, and we have to look for the closest we can find to that level of perfection, all while keeping an eye on the cost. If you could spend unlimited money, it would be great, wouldn’t it? We’re not there, just like you. The balancing act of cost versus value and utility is something we look at for every tool, accessory, or article of clothing we review. 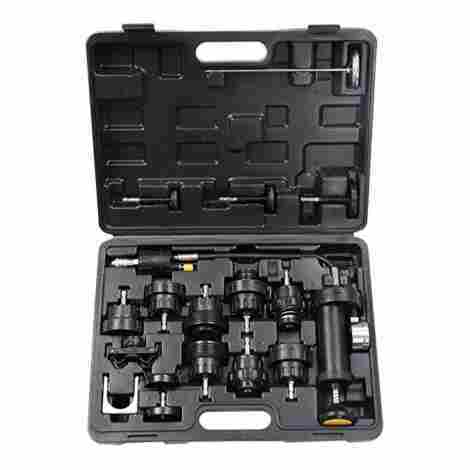 We also considered the availability of repair parts for your tool. The pumps contain gaskets and seals; some of the adapters have inflatable bladders. Those parts will wear and eventually need replacement. We rated tools with commonly available replacement parts higher on our list. A well-made tool fits your hand well and is easy to manipulate. We always look for the best in ergonomic tools when we shop for you! If a tool leaves you tired at the end of a long day, it’s not well-designed and less than the best fit for you. We consider this with all products. We look at materials and workmanship with an eye to durability. Will a product last as long as you need it to? As long as you want it to? If it’s well made out of good materials, the answer should be yes. After all, that’s a big factor in value, right? The longer something lasts, the more time you can spread the cost across. A tool that costs $70 and lasts 20 years only costs you $3.50 a year. right? And that is a great thing! Q: Why do I need to test my car’s cooling system? A: Your cooling system is filled with liquid coolant that circulates every second your engine is running. Gas, diesel, or hybrid, your car has a cooling system. The hot coolant circulates, and from the second the car leaves the factory, it’s looking for a way out. Eventually, it will find one, and then you have trouble. Finding that trouble is where the cooling system pressure tester comes in. It’s just a matter of time. Modern cars run for a very long time before there’s cooling system trouble, and modern coolants last tens of thousands of miles before needing replacement. Compared to the cars we drove decades ago, they last forever! But sooner or later you’ll need to work on that cooling system. Q: Would a cooling system pressure tester make a good gift? A: That’s a huge yes! What mechanic wouldn’t love to get one of these for any occasion from Valentine’s Day to a birthday to an anniversary? That would be a big surprise and much appreciated. And don’t you want your motorhead to think of you every time they take this out of the toolbox? You bet you do! One of these would make a nice gift. Q: I found the leak, now what? A: That’s the next step! Most important in your diagnosis and repair process is correctly identifying the problem. Once you’ve gotten that step behind you, the repair part is easier, because you are focussed on the correct issue. We’ve all just guessed at a problem before, and replaced parts at random until we finally got it right. Save your time, money and effort by zooming in on the problem area quickly and easily using a cooling system pressure tester!